We all agreed, at this annual conference, that risk should continue as a priority focus for the whole estate. In the light of recent high-profile cyber attacks and the current international climate, risk management is particularly important. 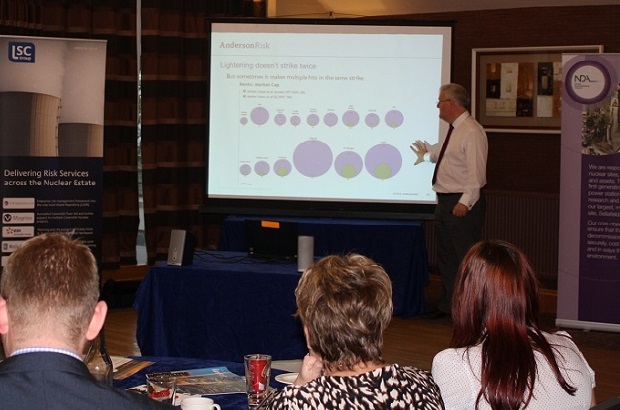 The day focused on learning, sharing good practice and how risks are managed by other industrial sectors. Risk management has increased its profile over the last year and continues to be an NDA Executive priority. The NDA vision is to ensure risk management is embedded into the way that we work. The conference allowed risk practitioners from across the industry to share their achievements, challenges and priorities. Together we can continue to drive forward risk management standards. John Clarke stressed the importance of the board and executive team developing a “corporate risk culture”. He highlighted how risk management will only work if there is the right tone from the top. He also discussed how risk management influenced decision-making. We need to achieve a healthy balance between looking at the ‘here and now’ and the ‘tomorrow’ - the latter is essential for a risk management culture. John Clarke, NDA CEO, thought this was a good session with some useful external input into issues such as "Risk Appetite". We’ve made enormous strides in the area of risk management in the past 18 months. The key messages taken from the workshop included that we are very much on the right track and, where we are still trying to get to grips with issues (for example risk appetite), we’re in the same boat as pretty much everyone else. If you would like to understand more about managing risk, the Institute of Risk Management website includes more information and resources.